The daily rate includes full space access max. For 15 persons (extra person at 10 €), sauna, towels, seat cover, firewood, basic cleaning (1 h), and accommodation for max. 10 people, as well as bed linen and made beds. The duration of the reservation can be e.g. from arrival day 16.00 - till departure day 13.00. Next accomodation days - 30%. Catering services as well may be provided through us. We do not serve alcohol, but if you bring drinks with you, the drinks can be served with the meals. As to your liking, you may provide the meals yourself. Seating for meeting and dining use is 24. Facilities allow variations for different uses. Sauna pulls 8-10 people at a time. The summer covered terrace can seat up to 40 people. Accommodation capacity is 10 persons. As an additional service, we can provide a 8-person outdoor hot tub for € 250. 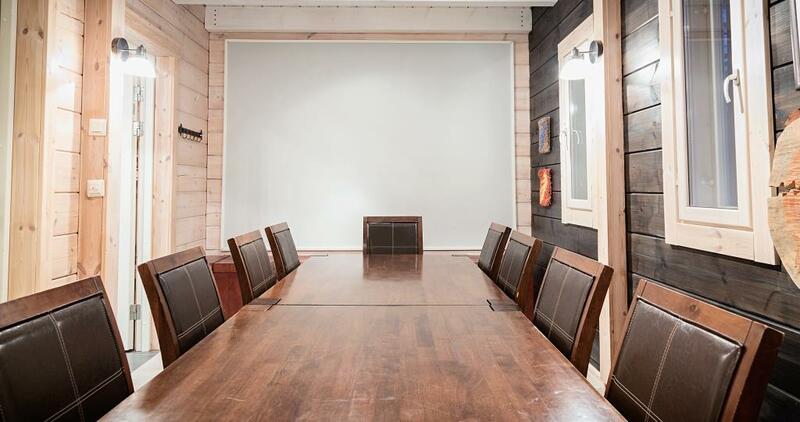 In the conference rooms (2) there is a wireless internet connection, 2 flip charts, and a projector with a size 50" TV for presentations etc. Karaoke gadgets belong in the equipment. There is a functional bar-kitchen (stove, oven, dishwasher, microwave, freezer, refrigerator, ice maker, coffee maker, toaster, kettle). There is tableware available for about 20 people. The operating instructions for the hardware can be found on the premises near the hat rack and the stove. Room rentals include 1 hour of basic cleaning. Prerequisite is that the space is basicallly clean, the dishes are dished, garbage bags are put on the outside bin. If there is a need for extra cleaning inside or outside, we will charge 100 € additional service fee. The person responsible for the reservation is responsible for any damage caused to the premises or furniture during the lease. The cost for the day conference is 320 € (incl VAT 24%) including the full use of premises for max. 15 persons, firewood, basic cleaning (1 h), no sauna use. Duration of reservation, e.g. from 9am to 4pm. Additional persons á 10 €. Catering services are also provided through our partner. Ask for an offer from Oskari Basement - www.oskarinkellari.com à Catering. We do not have alcohol licensing rights, but if you bring drinks with you, they can be served with the meals. You may want to take care of meals on your own. 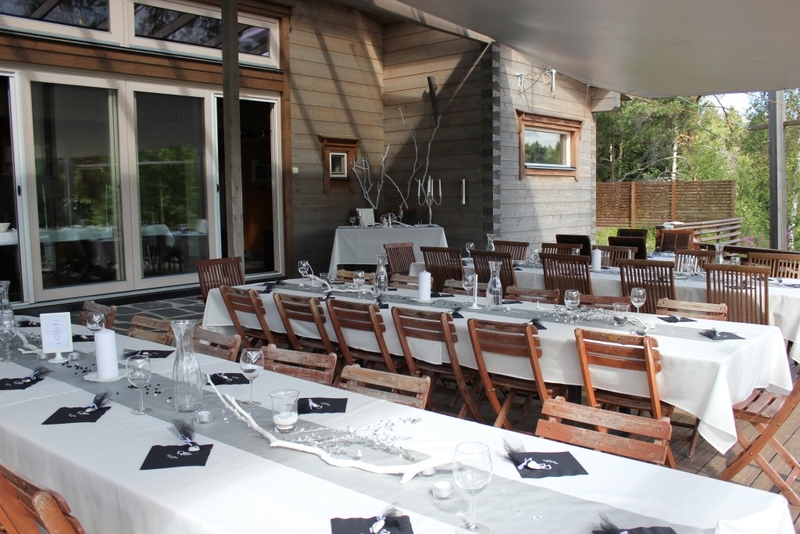 Facilities: covered terrace, banquet table, unique milieu and the sound of the rapids of Koiteli. Event for max. 85 people with a party tent. In addition to the previous one, a party tent is also available. Tent is equipped with chairs and tables, a dense base and a mat. Dimensions of the tent 5 x 8 m. Allows together with the covered terrace versatile variations and celebration program. Rental rates for a total of 1 250 €. Extra: Booking from Friday evening for party preparation and decoration from 3 pm. Additional cost + 300 €. 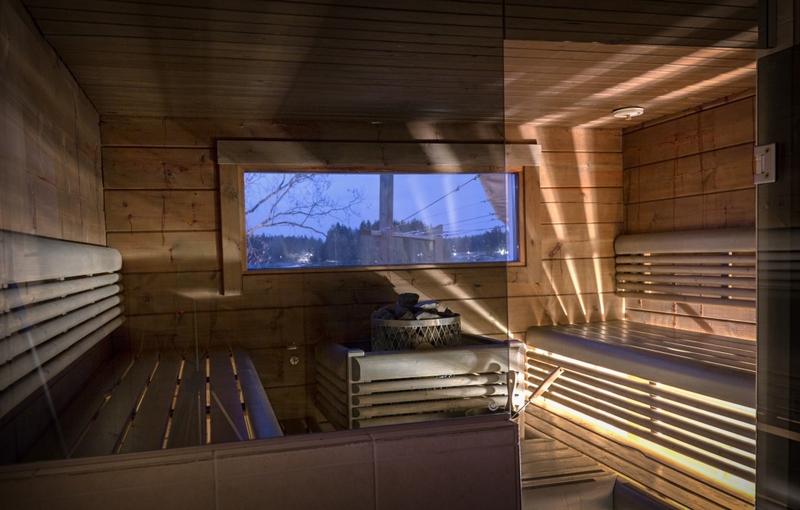 Sauna Night for 685 € (incl 10% VAT) includes full use of the property, sauna, towels, seat covers, firewood, basic cleaning (1h) and heated outdoor hot tub. Price for max. 15 people, additional persons for 10 €. The duration of the reservation e.g. from 17:00 onwards until the early hours. How does it feel to sit down on steaming water when outside it is freezing and night sky is gleaming with stars? You can observe the snow blanket next to you and hear the roaring sounds of rapids under the ice cover. You can stretch your hand towards the snow and let the snow melt into your hand. 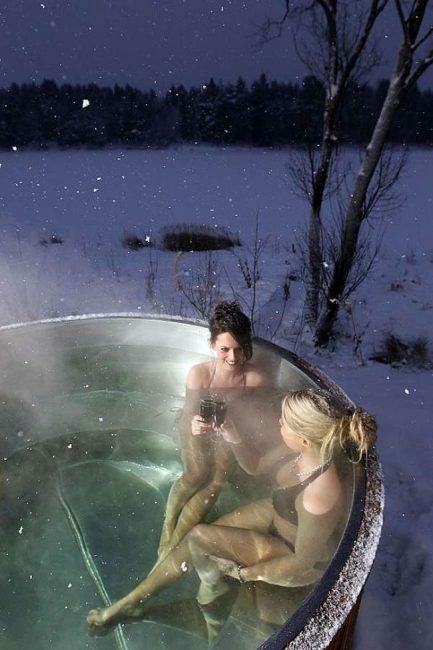 The scene of the cold wintry weather and the warmth of the tub water together create outstanding contrast that are making the dip into the water unforgettable experience. Finnish word for outdoor tub is 'palju' and it usually fits several people at the same time.Water stays warm because of the wood-burned stove that circulates the hot water around the pipes. Tub will be thoroughly cleaned and sanitized after each use and therefore stays clean and safe. The tub experience will be nice for those who want to relax with good friends and have an enjoyable time in the bubbling waters. In it you share your experiences of the day and get your body rejuvenated with new energy. Equipment: Swim suit and towels that can be rented as well. Nightly forest is not pitch-dark but light of the moon and the stars will be reflected from white snow in a mystical fashion. The trees look like dark animated figures with dancing branches hovering over the sky. If you are very lucky you might see the northern lights playing in the skyline. These lights of the north are created when the magnetic eruptions of the sun hit the atmosphere of the earth and look extremely mystical with its enticing hue. On the nightly moonlight walks you might see inhabitants of the forest: Rabbit jumping around or striped field mouse hurrying in the snow. Many of the species come out only during the night. You may walk around on the several paths as soon as your eyes get used to the dim but friendly light of the moon. Equipment: Warm clothes and flat-bottomed shoes that are easy to walk with. Preferably long shoes to avoid snow getting inside the shoes. Flashlights may come handy. It's a common knowledge in Finland that taking a dip into a ice cold water reduces stress, enlivens the blood circulation and nurtures your joints. Health factors are plentiful but ice swimming is also about challenging yourself. Finns love ice swimming as a test of bravery and it might be an important part of traveller's experiences of Finland as well. The hole into the ice is made by sawing away some ice from a small area. Descending the ladders into the icy water you feel like thoudands of tiny needles on your skin. You might feel an urge to run back to the warmth of sauna but if you overcome the initial reaction the feeling afterwards is incomparable. Right after getting up from the water you feel delightful warmth on your skin and you feel reborn. Ice swimming is all about challenging yourself and the others and on the contrary about beneficial health factors. Duration: Ice swimming should take about from one to one and half hours depending on the size of the group. Group size unlimited. Equipment: Swim suits and towels. Hailuoto is the largest island on Bothnia bay located next to Oulu. What would be better place to try ice fishing than on an island that has a coastline of more than 100 kilometres? In the wintertime there is ice road and when you do not have the ice cover ferries navigate the route regularly. Therefore you get the idea of the life on an island and its sealife already when you travel to Hailuoto. When icefishing you make a hole into the ice by drill and drop fishing lines into the hole. Then you can relax and sit on a stool just waiting if the fish eats the bait. Ice fishing takes great patience but is extremely rewarding as it gives sense of peace and connection to the nature. You can sense great harmony when sitting on wintery ice with boundless whiteness of snow around you.The ice in itself spreads all the way to the horizon and humans or other living beings barely exist. Only silence persists. You need to wake from your thoughts only when a fish twitches the fishing line, until then you can enjoy the feeling of stillness and concentrate on the pure existence. Around the island of Hailuoto the sea is rich in fish and the quality of fish on high standards and therefore good for eating. You can also find places to make fire and enjoy your delicacies just as fresh as possible. The equipment: The organizer of the trip provides the ice fishing equipment. Make sure you have enough warm clothes, the winter wind can be chilling. Waterproof clothes would be optimal with windproof qualities highly recommended. Size of the group: No limits usually - if going by car the group size is limited to the size of the car. There are so many things you can do in the snow and ice. You can try traditional Finnish winter sports and activities. On a trip to Kiiminki river you can do some skiing, kicksledging or ice skating. The springlike milieu and the glimmering snow entices you to take part in outdoor activities. Even Finns do often crawl out of their houses after dark midwinter to enjoy the sunnier snowy scenery. Kicksledging is consider to very Finnish activity though in reality it was invented in Sweden. Finns refined it to what it is today by adding skids made from iron so that it was easier to steer the kicksledge. Oulu is a good place to learn the basics of kicksledging as the first kicksledge team was formed here in 1890. Kicksledge is a bit like foot scooter with two flexible skids. You keep one of your leg on the skid while gathering some speed by pushing backwards with your other leg. The whole equipment slides lightly on top of the ice and the steering wont take great effort. Traditional skiing isn't all that simple but great fun once you get hold of it. To find the balance and to be able to slide across the surface alternating with both legs is something that you might have to practice a bit but skiing really is fascinating way to enjoy the spring snow. Finns were able to secure defensive victory in the winter war 1939-1940 and lot of us believe it was largely because of being capable of skiing. Quite many Finns are still very proud of this legacy and tradition. Ice skating at the nature is a lot more captivating than in ice rinks indoors. When you are sliding on top of the ice you may enjoy the forests surrounding you and the healthy and refreshing air. If you haven't done ice skating before you may not instantly slide fast. But in this sports you can improve easily and little stumbles are nothing to get worried about but rather something to laugh with your friends. Ice skating is quite a common activity but it becomes something quite extraordinary once you do it on the spectacular river ice location. Authentic local fish and cozy restaurant setting. Vihiluodon Kala fish restaurant is exactly that at its best. The design fo the building reminds of a fish or a huge wave in its plain form. Its facade is decorated with small fish patterns. If you are interested in Finnish design just the building in itself is worth seeing. 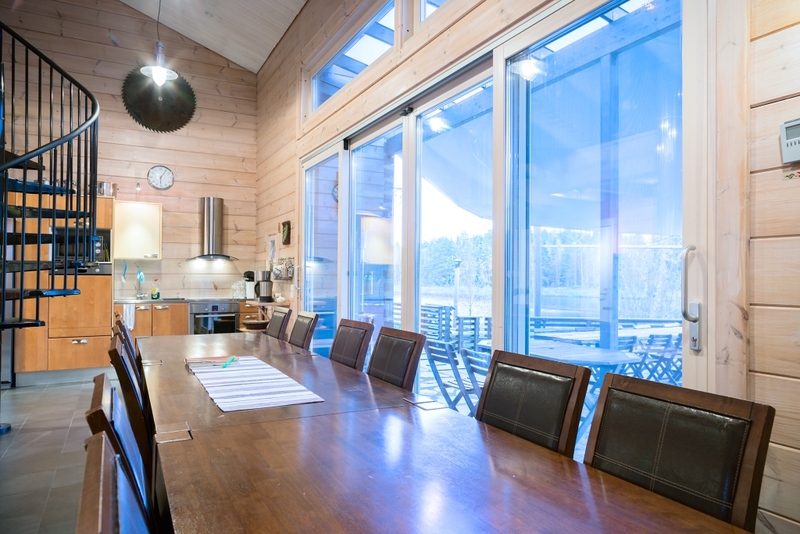 The functional design is modern Finnish building design at its best. The material is mostly wood that is ecological and very Finnish choice overall. The freshness of the fish will be guaranteed as the production facility is located in the same building. Apart from the fish also the other ingredients are mostly local products like Tyrnävä potatoes and vegetables from Liminka. You can try out local Finnish fish like bass or Baltic herring. What would be more local product than a tar flavoured herring as Oulu is renowned for being the old tar town? Finland is also known for the highly recognized salmon and Vihiluodon Kala produces salmon in various forms. You can choose between salmon soup, steaks, gravlax or blazing salmon. The menus change constantly but there is always several great choices to be made. Of all Finnish architects Alvar Aalto is easily the most well-known around the world. His functional design has gathered praises all over the world. Although Jyväskylä is the most important Aalto-town in Finland, Oulu has retained some exciting and interesting buildings especially in Toppila area. The industrial area was built in 1930 and still has some of its buildings in reuse. Also Oulu Climbing Center is situated in the old pulp mill's power plant. With the high windows and red brick structure the building glows bygone times' factory atmosphere. It is great depiction of its time. Just as great example of Aalto architecture lies closeby to the plant. Old silo functions now as cultural center with sturdy church-like design. There are couple of other Aalto buildings still around with some stores etc. housed in them nowadays. All of the remaining buildings have gotten a new life and therefore proclaims Aalto's vision of functionality first and foremost. The buildings by Aalto are showing traditional Finnish design and therefore invite people to get inside and see what is Finnish design and creativity these days. The old silo that works as a culture center is the center for communal art that promotes the collaboration of art and society.